Our newsroom has a door. But that’s not the point of this post. Over the years, this door has become more than just a way in or out, or something that occasionally gets “stuck” with our editor on the other side. It has also become a Mecca of sorts. A place where journalists since the 1970s have taped, glued, pasted or otherwise adhered (you don’t want to know) headlines that are either badly written, clever or misspelled. It is a beacon, really, harkening us into the jagged rocks of journalism. Since the final edition of this weekly feature was posted exactly two years ago today, nearly 3,000 folks — reluctantly, accidentally, regrettably or otherwise — have started following this blog with little or no knowledge of The Door and it’s historical significance to journalism. Through the month of February, I thought it would be fun revisit our newsroom door each Wednesday to highlight some of the best of the worst headlines that grace it’s simulated wood- paneled surface. Since I can’t afford to fly all of you here to see it, and because I have nixed the idea of detaching the door and sending it to each of you to see for yourselves, I’ll be coming to your homes or places of employment to show you my favorites. It will be just like having me standing there next to you with our newsroom door! Except not as creepy. The first entry from the The Door was a headline that I think is possibly the best in the history of newspapers. It does what a headline is supposed to do, which is sum up the point of the article in one eye-catching moment. 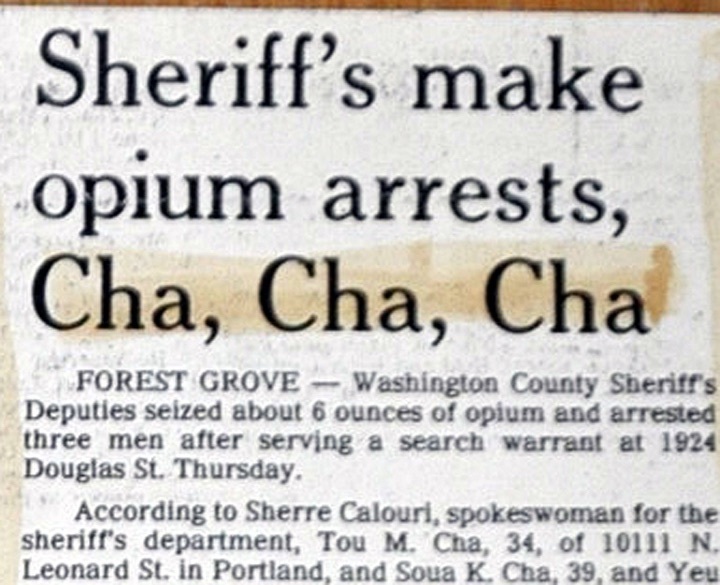 In this case, the editor also recognized the once-in-a-lifetime opportunity the circumstances presented: Police in Forest Grove breaking up a drug ring operated by the three brothers — Tou, Soua and Yeu — who share the last name “Cha.” The headline is true brilliance. Or possibly the result of too much cold medicine. So funny. Now I have the urge to break into a dance step. Probe again? 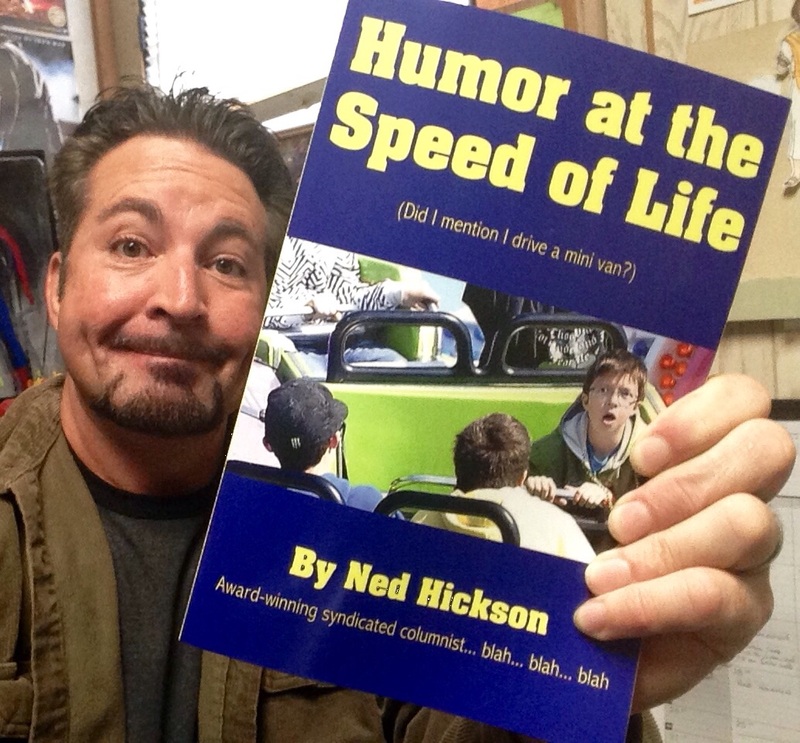 First we had hernia threads – underwear funnies – then Vietnamese Navy jokes on U-Boats – now we’re back to the back door jokes? I’m getting C sick………….. I saw a show with a kiddo dancing to Conga Pete last night. Cha Cha today? I think you are telling me to quit work for the afternoon and go dancing. At least, that’s what I’m gonna tell me boss when he asks. Love the new Wednesday feature! This will be fun! The sign for me is the one from The Far Side: Midvale School for the Gifted…where the dude is pushing the pull door. Makes me think of Elaine dancing on Seinfeld. Those were the days. HA! If only I could trace time. A mate of mine once wrote the headline for Caledonian Thistle beating Celtic: Super Cali go ballistic, Celtic are atrocious. But my favourite, from when I worked on the Oxford Mail was the simple, Queen Mum can’t come. The most bonkers head was Burglars in below empty flat, which I still don’t get, even after having it explained to me. LOL! That is absolutely FANTASTIC! I’m saving a place on The Door for it should I ever be lucky enough to find a copy. Shame about the redundant apostrophe, though. What were the sheriffs’ names? Tango and Cash? Speaking of past used inspirations – how’s Sparky the killer squirrel doing? Did he have a good holiday season? Cool headline Ned. The Cha brothers are old hands. In fact when they were young and training they were called Choo, Choo, Choo. I’m thinking it might be time to update everyone on Skippy’s the Rabid Squirrel’s progress with anger management. Oh Oh – I got Skippy’s name wrong – please apologize to him for me. I am appropriately chagrined at my faux pas. So, the Train – Choo, Choo, Choo wasn’t very funny , huh? Sigh, it was the best I could do under the circumstances – sorry. Prepare the Maple Syrup!! I had forgotten about Cha, Cha, Cha – but now I’m hearing it in the voice of Carol Channing….I need to lie down. Dear God…what have I DONE?!? and they also busted up a drug smuggling ring south of the border – hey, macarena! I know the editor must have been kicking himself after he found the error. It’s like painting the Mona Lisa and then realizing there’s an extra nostril. I have to admit, if I were tasked with writing a headline with those names, I’d have done the same. You don’t get an opportunity like that very often, you know. Exactly. Even if it lead to gettting fired, seizing that moment would have been totally worth it. Sorry, you couldn’t send the door. This was the next best thing. Look forward to next week. It’s been two years since The Door was a weekly feature? I’ve been reading you that long? This explains some things. I’ve missed The Door. I’m glad you’re sharing it again this month. The “I’ve been reading your blog this long?” reaction is pretty common from readers. That headline is so good that I would be overtaken by jealousy, if not for one thing. You mentioned your editor at the beginning of this blog. I was overtaken by a sudden craving for Cheetos that overshadowed the overtaking of over jealousy. It’s always that way with Cheetos, isn’t it? It’s been referred to as falling down another kind of hole, but I like your comparison better. Speaking of “back door news” I recently got an email with the Subject Line: Protect Your Sheets! – I was infuriated!! I don’t make doo-doo in bed!! Incontinence is a very touchy issue with me!! I zipped off a nasty reply to the sender and blocked their domain from my InBox. So………………….Yesterday a friend writes me to ask if I had seen this method of protecting spreadsheets from Dylan the Gooru in NYC. That was the guy I blocked. Hahaha! Maye it will inspire him to come up with a new “subject line” in his emails!